Acrylic on canvas 30 x 30 inches Rick Garcia's RAG13 Collection is inspired by the observation that there has been a significant and permanent change in our public and private lives. These artworks use symbolism to illustrate how the ubiquitous presence of suspicion and the act of being a suspect have both become a way of life. Adults and children are shown as generic solid shapes with parts missing to indicate loss of identity and the relinquishing of certain rights. The watchful eye of authority is always present as a figure dressed in black with three white stripes. All of the figures have a red dot to symbolize the human heart; how we are all connected. This red dot also represents being a target or a person of interest. Overall, this latest series creates a surreal flow of images, colors, and shapes blending into a beautiful and poignant work of art. About the Artist: "Photography has been part of my creativity throughout my life and more recently has become influential in my abstract work on canvas. 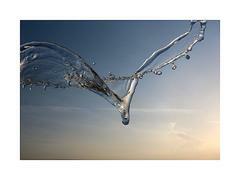 The magical shapes of water gracefully floating or scattering in mid-air reveals the true god-like essence of nature. I am fascinated studying these images of bright tiny mercury-like globes, silky trails, dancing droplets and crystal clear languid sheets. " Rick Garcia was born in Havana, Cuba, and very soon after, his parents relocated to Miami, Florida. He was always encouraged to follow his dream of pursuing and developing his talent in art. In later years he found a deep-rooted connection to surrealism, especially the work of Salvador Dali. Garcia had become obsessed with the unique images and amazing technique of the Spanish painter and he eventually traveled to Port Lligat, Spain to visit the home and surroundings of his mentor. After years of attending the Art Institute of Miami, where he refined his artistic vision in drawing and painting, he was soon earning an income from published illustrations. Garcia has enjoyed a rich and diverse career starting with the hit TV show "Miami Vice" commissioning him to create a mural on the side of a three story building, and used his paintings for interior shots. Apart from a growing number of private commissions, his distinctive images were commissioned by The United Nations Postal Administration in 1998 and 2003. His stamps brought awareness to the growing extinction of the rainforest and its inhabitants, and followed with the 50th Anniversary of the World Health Organization, bringing awareness to the vanishing supply of freshwater, where it earned him the prestige of the most beautiful stamp series of 2003. Garcia was chosen as an "Absolut Artist of the 90s" in the popular vodka ad campaign and with his second piece Absolut Electric, this further drew worldwide attention. 1998, 1999, and 2001 garnered him the distinction of official artist to The Grammy Awards where his creations influenced the look of the live broadcast and graced the covers of the official program book, CDs, posters, apparel, and other various items. His work included portraits of stars such as Destiny's Child, Ricky Martin, Coldplay, Santana, Celia Cruz, Black Eyed Peas, Imogen Heap and Kanye West. His life long passion of thoroughbred racing tapped him in 2008 to be the official artist of the 2008 Kentucky Derby Festival. Founder of Benihana, Rocky Aoki, gave Rick complete creative control to design a sushi restaurant on Miami Beach. Along with sculptor Bruce Hanners, they built and installed an 1800 sq. ft octopus designed by Rick to be the massive ceiling light fixture. Made of fiberglass with internal computerized lighting, it hung over this cutting edge design featuring the Japanese style of delivering fast food, "Kaiten". Other design elements included artworks and custom light fixtures throughout the restaurant including the restrooms.